Martha Loats was born on March 13, 1924 in Los Angeles, California, and graduated from Belmont High School Summer 1942. During the war she held several jobs including working for the American Red Cross. After the war she attended Los Angeles City College for a short period, married and returned to work so her husband could resume his education. Her main employment after having one child, a son, and attending business school, was with the University of California, Los Angeles School of Public Health, and retired from the position of Principal Administrative Analyst in 1980. 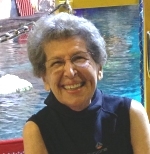 Martha then moved to Albuquerque, NM and attended the Albuquerque Technical Vocational Institute before returning to California in 1985 to watch her grandchildren grow up. She worked at Toyota Corporate Headquarters as a Budget Specialist, retiring at age 65, moved to San Jacinto, California and volunteered at the Hemet Police and Hemet Fire Departments, and other not-for-profit organizations. In 1994 she moved to Denver and resided at the Christian Living Communities, University Hills Retirement Community until the end of 2000. In May of 2013, Martha moved back to Clermont Park (formerly University Hills), which was renamed in 2010. Moving to a retirement community in Denver is one of the smartest things I have ever done. Soon after I moved here I began volunteering and took the Eden Alternative training course and became an Eden Associate. I also participated in the Masterpiece Living Lifestyle Review and programs. The philosophies of the Eden Alternative and Masterpiece Living have inspired me to pursue some long held dreams and to create some new ones. Thus, I began my adventures . . . The first was skydiving on my 90th birthday. Since my birthday is in March, I made reservation to skydive at the Camarillo Airport in Southern California, close to where my family reside. In addition to skydiving, we had a fantastic birthday celebration which lasted several days. I was the oldest person to skydive at that location. It was an awesome experience. I never felt as if I was falling, it felt more like floating in the sky, then the parachute was opened and my instructor Dan and I could converse. The view was spectacular and the landing felt as if I just stepped out of a cloud. I hope to go skydiving again on my 95th birthday or sooner. My next adventure was ziplining. My friends Diana and Marty Flahive took me on a wonderful belated birthday trip to go ziplining. I had a reservation at Glenwood Springs, Colorado and they had been told I was 90 years old. They said it would be no problem. But when I arrived, I was told I couldn’t go ziplining, they refused to give me any assistance and told me I wouldn’t be successful. I think it was age discrimination. That didn’t stop me. My friends drove me to Vail, I was treated royally, and yes, I went ziplining. The view of the mountains was spectacular and it was so quiet and peaceful, but much too short a ride. I would love to go again now that I know what to expect. Then I was fortunate to be invited on a balloon ride with four other Clermont Park residents, three staff members and the pilot—another awesome experience! We climbed to 10,000 feet, it was so quiet and peaceful and the air so pure. We saw other balloons in the sky, the mountains, the scenery below, then landed in a suburban neighborhood park where families came out of their homes to greet us and take pictures. A few days later I was the oldest person to go scuba diving with the sharks at the Denver Aquarium. A Clermont Park staff member, Moriah Bernhardt, who is a certified diver, went with me. My instructor was Jenn, and she and another instructor, Bill, were with me all the time. I was surprised and amazed by all the fish, turtles, and sharks around me. I was even able to see and wave to all the people watching. An experience I do not have words to describe except that it was unbelievable and exciting. I now know what do the next time I go scuba diving – concentrate on my breathing (don’t smile at everyone), relax and let the instructors assist me. On August 21, 2014 I graduated from the Clermont College of Creative Life where I delivered one of the Valedictorian speeches, and a day prior to graduation I paddled in a canoe in Chatfield Reservoir. I recently experienced a health challenge. I had to spend time in the hospital and at doctors’ offices. But that hasn’t stopped me. I am determined to LIVE my life to the fullest. I have other planned adventures during the 90th year of my birth. In October I will be acting in the production of ‘The Music Man’ here at Clermont Park along with other residents. My purpose is to live a wonderful fulfilling life full of challenges. My motto is “Aspire to Inspire before I Expire.” So, if my adventures inspire others, young and/or older, to take a leap and live successful, meaningful and purposeful lives, then I am ever so happy to share them with you. Check out other similar posts in the Life category. Way to go Aunt Martha!!!! !